Channel partners move around, it’s a fact of life. While there can be many reasons for this, one of the issues continually raised is they move as a result of lack of support. While many vendors and distributors would take umbrage at this statement, in today’s economic climate, one cannot afford to lose partners for any reason. Indeed it is the channel marketeers’ job to ensure that they do everything in their power to keep, improve and enable their partner community. Enablement can be come in many forms including: personal relationships between the tiers of distribution, availability of accurate and up to date information, knowledge of vendor activity within the sector as well as ensuring the partner has the tools with which to do their job. 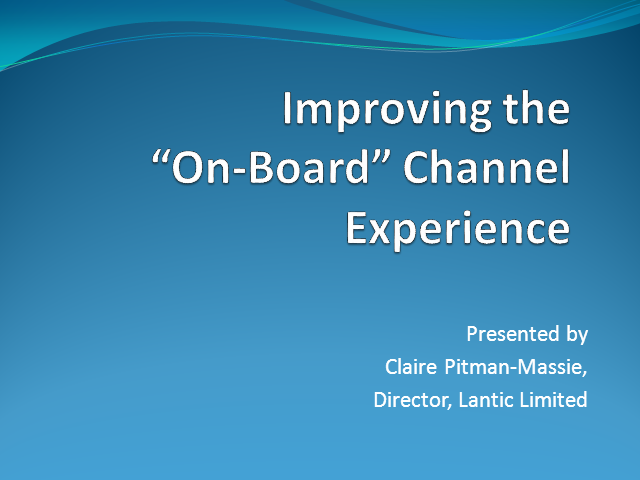 This webinar walks through these four key areas of enablement and offers some advice on how better to engage with your channel partners or in other words, how to improve their “on board” experience. This webinar is aimed at channel marketeers with every level of experience, across all communities, vendor, distributor and partner. With nearly fifteen years’ in the technology sector, Claire has sat both sides of the fence when it comes to channel marketing. From partner through to vendor Claire has had extensive knowledge and experience of working with all levels of channel from the entrepreneur reseller through to the largest of global system integrators. Now the owner and Director of her own marketing consultancy, Claire is in continued demand for both field and channel marketing services as well as sitting on several Boards of technology organisations as a strategic marketing consultant. Her extensive background and client base spans from being one of the initial team of Vistorm, SafeStone Technologies, CipherTrust (now McAfee), Presence Networks, Proofpoint, through to more recent award winning clients including: ChangeBASE (now Quest), Webroot and Avecto.